Did you know that 80% of dogs show signs of dental disease by the age of 3? I don’t know about you, but I think this is a pretty scary statistic. As a pet parent, I worry a great deal about Ivi and Rylie’s teeth, especially after seeing how many teeth poor Molly (the senior pup of our family) has lost over the years. 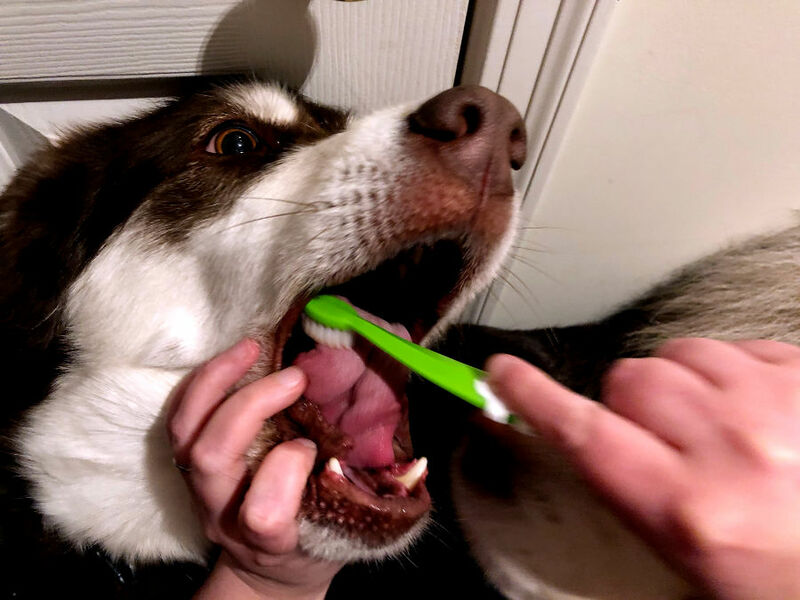 To make sure the girls stay healthy as long as possible, we take dental health very seriously in our household. One of the biggest issues I have found, though, is finding a quality dog dental kit. Since finding one with quality ingredients is so challenging, many people think natural human toothpastes are safe (please never do this! Many use xylitol – a well-known dog killer, despite being safe for humans). 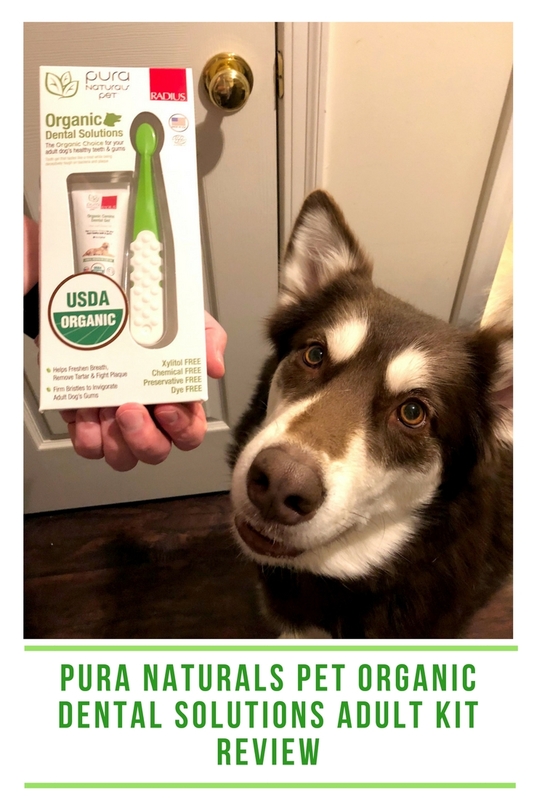 Recently though, one of my favorite companies has come out with a new dog dental kit that doesn’t just use high quality ingredients, but qualifies as USDA organic too – Pura Naturals Pet! After reading a bit about their Organic Dental Solutions Adult Kit, I couldn’t wait to try it with the girls! Pura Naturals Pet Organic Dental Solutions Adult Kit: What Is It? Are you looking for an easy way to keep your dogs teeth healthy and looking amazing? If so, we think you will love the Pura Naturals Pet Organic Dental Solutions Adult Kit. This USDA Certified Organic kit includes an ultra soft tooth brush and tooth gel, both of which work together to freshen dog breath and remove tarter, and fight plaque without the use of preservatives, dyes, and other chemicals (oh, and of course, xylitol free)! Salt – helps reduce bacteria in the mouth to freshen breath. By fighting back against dental disease early, it also means fewer vet bills are likely, allowing us to spend our money on things our dogs enjoy – like toys and treats! What pet parent wouldn’t smile about that!? So what do we think of this dog dental kit? So far, I absolutely love it! One of the first things I like so much about the kit is the smell. It has a bit of a minty, herbal smell (with a bit of fennel), it actually smells quite good but not overpowering. I don’t know about you, but I don’t exactly like dealing with everything smelling like chicken (especially since it is usually not the best smelling stuff for humans). As well, this has to be the best toothbrush I have seen for dogs – hands down. It reminds me quite a bit of a human toothbrush, but the extra long handle with texture makes it easy to use when you are in your dogs mouth and working. Overall, I think it makes brushing teeth a better experience for everyone involved, making the Pura Naturals Pet Organic Dental Solutions Adult Kit an amazing products in my eyes. Pura Naturals Pet Organic Dental Solutions Adult Kit: Where to Purchase? Would you like to purchase this awesome kit for your own dogs? 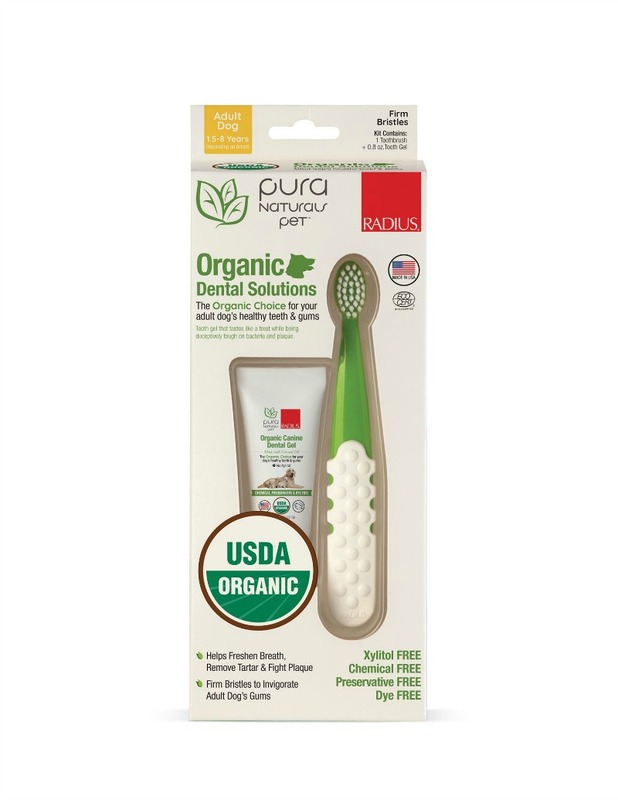 You can buy the Pura Naturals Pet Organic Dental Solutions Adult Kit on the Pura Naturals Pet website for only $14.99. We are pretty certain you will love this dog dental kit as much as we do with our girls! Cats need brushing as well…or so my vet says. I say, you try to brush my cat’s teeth: I’ll see you in emerg! Yes! We just bought this for my dog and it works wonders! Thank you. I am definitely checking this product out. I’ve been looking for a good solution to my pets’ dental needs. Good brushes, I brush my cats teeth too. It is really important to take care of your pet’s teeth and this kit is at a great price. I doubt my cats would let me do this though. I like that the ingredients provide extra benefits, and the price is very reasonable. I wish they had something like this for my cat! I like the fact that this product is USDA Certified Organic. The fact that this product doesn’t have an overpowering smell is really good. You have made your point quite well!! The dog would let me do his, the cats… well no. I love how affordable it is and it looks like a fantastic product. The scent of this tootpaste sounds so much better than chicken toothpaste! With all the natural ingredients, it sounds healthier for dogs’ mouths too! I’d love to take care of my cat’s teeth too, but I don’t think she would permit it. I haven’t heard of this but it sounds like a great product, and it would be good to have for my dog. I have never seen this before. I have seen the special dog bones that can be chewed but this looks even better. I will be buying this for my sister’s dog! I love that it contains ingredients I can pronounce! Cleaning my dog’s teeth at the vet is super pricey and this looks like an affordable solution. I think our dog would love this product. I’ll check it out next time I’m at the store. Thanks for posting! I love this as an all natural product for pets…their health is important too! 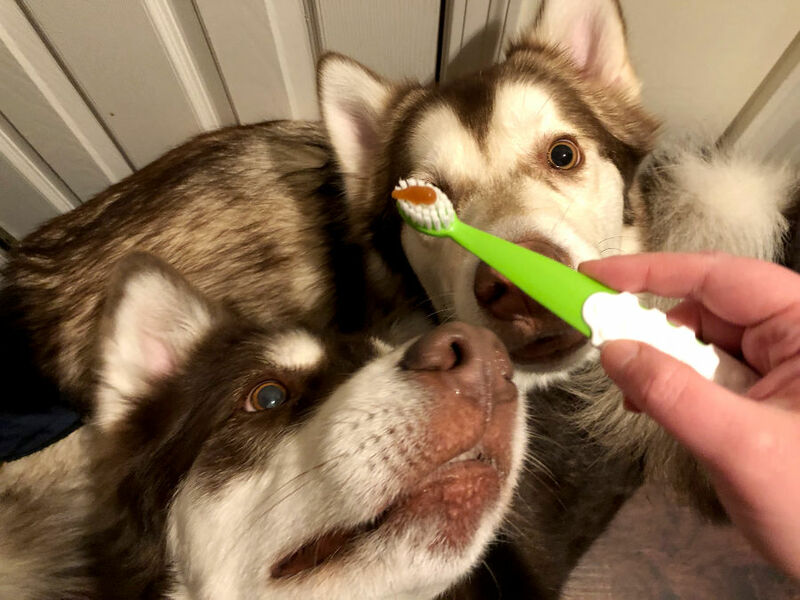 Your dogs are so cute–I wish my cats wanted to have their teeth brushed like that! Heh! This product is awesome. I need to get this for my pooch. This sounds better than human toothpaste, lol! I’ll have to try it for my fur babies. I swear I did not know that many of our toothpastes uses xylitol – a well-known dog killer, despite being safe for humans)! I’m glad I never used our toothpaste on our furry friends! I felt that buying them their own kits was worth it and a small price to pay to keep them healthy! I pinned this important article! Thank you for sharing! WOOF!! My dogs are still young today (I have four, three females and one male), their age varies between 6 months and two years and I can’t see any dental problems yet, so what to do? Should I try the kit on my older dogs? I love the ingredients in this kit, and they don’t seem to mind it at all – must be how gentle you are!